Savor a snack of high-protein amaranth mixed with honey, nuts, and seeds. When you think "candy," you probably don't think "puffed amaranth." Let us change your mind. In Aztec times, a paste made from the protein-rich seed and agave—a sweet, thick nectar—was used to craft ceremonial sculptures. In modern Mexico, it's mixed with honey, nuts, and other seeds to form alegría, a traditional sweet whose name means "happiness." (Aww.) 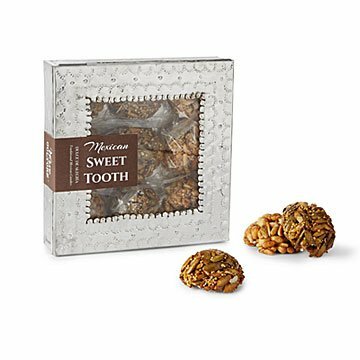 Here, nine nutty, satisfying servings are housed in a giftable tin box, hand-pressed with folk art decorations that date back to the 1500s. Once the candy feasting is done, it make a beautiful jewelry or keepsake box. Handmade in Mexico.